I had instrumented a driver to capture certain file system related data in Windows kernel and it happened that there were some problems using the binary. I rebuilt it without any code changes and deleted the old data. At the problem site, the original binary was used for which I deleted symbols. The problem now – how do I analyze data without right symbols? Though the symbols for new and old binaries must be same, WinDbg would not load them for mismatch in timestamp. From the huge set of commands that empower WinDbg, there is one – .symopt that helps control WindDbg behaviour relative to symbols loading. Setting SYMOPT_LOAD_ANYTHING symopt, I was able to load new symbols for old binary. Once you have the symbols loaded, you can use !chksym or !itoldyouso debugger extension to know where the symbol is loaded from. 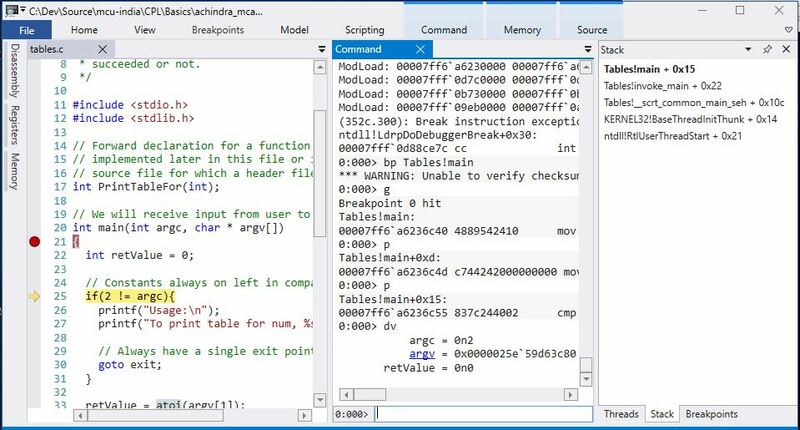 .symopt command can be used to display or set symbol loading options for windows debugger. Some of the interesting options are discussed below. If you do not find symbols at the expected location for some reason, this option loads the nearest match. Debugger will match symbols from already loaded modules only and won’t try to auto load modules. Thus debugger will respond fast to mistyped symbols as it won’t go on searching all unloaded symbol files. Debugger will only load symbols that exactly matches. Enables debugger to search for a symbol in private symbol table and if no match is found, only then will it search in public symbol table. Turns on noisy symbol load, !sym noisy and !sym quiet toggles this. Another interesting command is !lmi, <module> which generates detailed output about a module. This is my preferred choice over lm vm <module>. !lmi analyzes module headers and generates a formatted summary of the information found there. But if module header is not there in memory dump (paged out), an error will be generated. Image Type: MEMORY – Image read successfully from loaded memory. Symbol Type: PDB – Symbols loaded successfully from symbol server. PS: I have also seen .reload /i <module> helps load the symbols ignoring any mismatch in pdb versions.